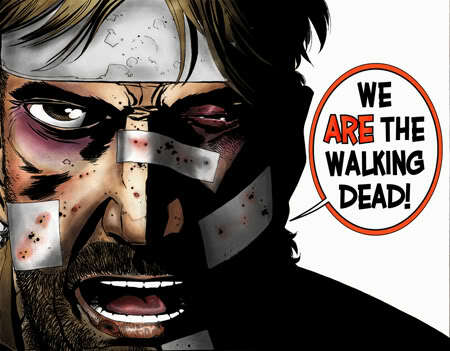 Lately, I’ve been devouring Robert Kirkman’s “The Walking Dead”, a comic set in a post-apocalyptic zombie wasteland with a narrative focused on the daily lives of the non-zombie survivors. It sounds bleak, but it’s a good drama piece on how things fall apart in a crisis whose scale is beyond any individual’s comprehension. I’ve started to see it as a bit of a parable for the current global situation and the probable future scenarios that await us: the constant hunt for food and shelter, and the vigorous and brutal means used to secure those same essentials. While most of the population of our world hasn’t turned into actual zombies, there’s a lot of parallels between our world and that of the comic. Lack of significant savings: According to Garth, seven in ten Canadians have no corporate pensions, sixty per cent have no money saved, and only five in ten have RRSPs. Of the fifty percent of Canadians that do have an active RRSP, the average amount saved is a little over $40K. Have significant debt: Canadian families owe $1.45 for every dollar they earn, and carry an average debt of more than $25K. Are overexposed to risk: Canadians are funneling a more and more money into real estate. Average cost of a house in Vancouver is upwards of 8x on average household income. Are at or nearing retirement: There are nine million boomers comprising 32% of the population of Canada. The country is aging, and it’s only going to get worse. Oh, and we’re not alone. No sweat, I hear you saying, I’ve sorted my own finances out. Which is just fantastic – at least someone’s been thinking ahead. In preparation for the Financial Zombieland that awaits us, you’ve at least been stockpiling cans, guns and ammunition. You’ll at least make it past the first wave of the outbreak. The safety net will slowly disappear: Governments, being borderline insolvent, will look to dramatically trim expenditures while expanding taxation. One only has to look at the four-year “plan” in Ireland, and the economic restructuring in England to get an idea of what’s on the horizon for previously government-provided social services. Things will cost more: Anyone who’s been paying attention has noticed that resources are becoming more hotly contested. China is playing chicken with the IMF by gobbling up resource rights in Africa in exchange for infrastructure, a flagrant violation of IMF’s rules that require those rights to be used to pay each African nation’s outstanding debts. Not only will resources cost more, but demographics and entitlements will force governments to find new sources of revenue. Read that: raise taxes. Growth will be constrained: The natural response on the part of consumers and companies will be to find ways to conserve cash. In the wake of the economic crisis, US savings rates have increased dramatically. Canadians, believing they’ve avoided the worst, have decreased their personal savings rates; however, this will change as it becomes clear that no one can escape the grasp of the global economic decline. The upside of this reshaping of our society is that it might be just what we needed. Just as in “The Walking Dead”, this crisis may have an upside. If nothing else, it may force us to shuffle our personal priorities. Perhaps we’ll reduce our consumption, redefine how we work, and reverse some of the global destruction we’ve wrought.